Agility for 2016. What an awesome achievement. conceived since. Well, Peak decided it was his turn to try and try he did. The litter is due on the 12th. GOOD LUCK Dash & Antonia, may the course be with you both. worked very hard to be the team they are today. Congratulations from the Daisylane family. generation of Denzil grand-children to start in agility. 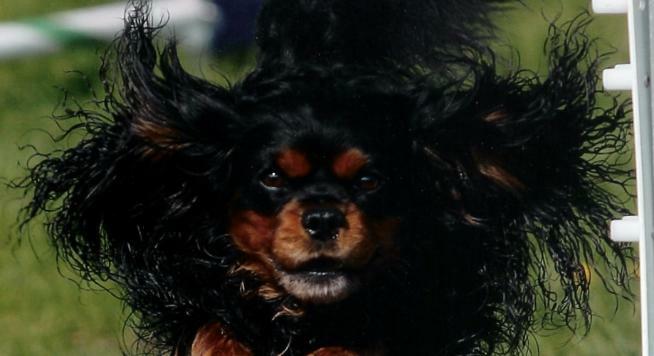 Daisylane And The Beat Goes On "Dash" competed at the 2014 AKC Invitational in Orlando, Florida. Dash's runs can be viewed on the agility video web page. Congratulations to MACH Dylan and Steve. Dylan is the ninth cavalier sired by Denzil to earn a MACH. viewed on the agility video web page. healthy. Soon there will be five more Daisylane pups on the agility course. Layla earned her MACH3 and Rowan earned his MACH2. Congratulations to both. the 16 inch division. Click here to view Wayne & Merle's finals run. Daisylane paws competed in the Westminster Kennel Club Masters Agility Show on February 8th, 2014.
was selected. So Marlee, Summer, Layla and Peak took their paws to NYC Pier 94 to compete. placing 11th in cumulative totals. So the Daisylane paws did very well. You can view their videos on the Agility Video page.